Enjoy the best inspirational, motivational, positive, funny and famous quotes by Afua Cooper. Use words and picture quotations to push forward and inspire you keep going in life! Lawrence Hill, a cultural and spiritual descendant of West African griots, has used his vast storytelling talents to create an epic story that spans three continents. The Book of Negroes recites the pain, misery and liberation of one African woman, Aminata Diallo, who was stolen from her homeland and sold into American slavery. 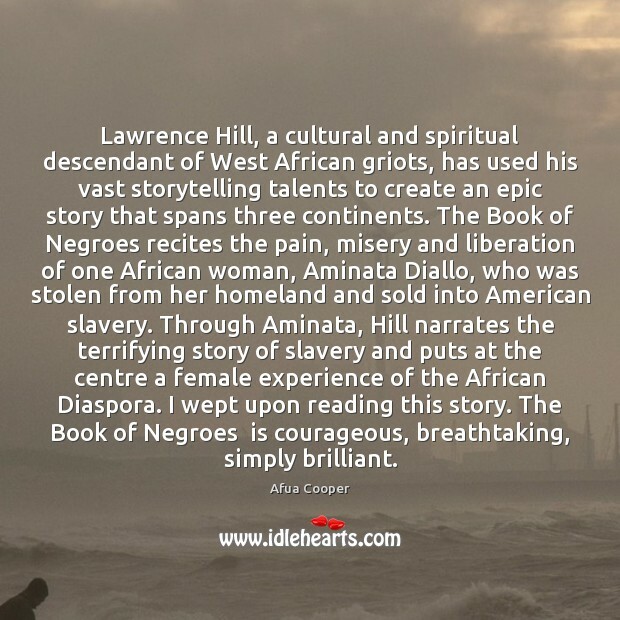 Through Aminata, Hill narrates the terrifying story of slavery and puts at the centre a female experience of the African Diaspora. I wept upon reading this story. The Book of Negroes is courageous, breathtaking, simply brilliant.